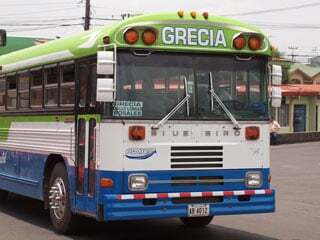 Cars can be expensive to purchase in Costa Rica, so traveling by bus is an affordable and efficient way to get around. When moving to Costa Rica, many newly-arrived expats decide to forgo having their own car. In retirement on a limited budget they want to eliminate the added expense of maintenance and fuel for a vehicle. Cars can be expensive to purchase in country and import from North America too, so that’s another reason to go car-less. Unlike most areas in North America, the buses aren’t a service of the municipality. The routes are run by private companies. Many Costa Ricans do not have a car or there’s just one car per household. And that means that many people still use the bus regularly to get to work, school, the market, into town, or to the homes of family and friends. So no matter where you go, you’ll see buses criss-crossing the countryside. Although not as convenient as having your own vehicle, depending on public transportation, mainly buses but also taxis as needed, is perfectly doable. And many expats have embraced that lifestyle, following the example of their local neighbors. Except for the most isolated areas, there is usually a bus from outlying areas of a town into the center with plenty of stops along the way. Sometimes bus stops aren’t clearly marked. Ask a local about the stops and the times the bus passes by, usually every hour or half-hour. The cost is less than a dollar per ride. A bus terminal, usually attached to or nearby the town’s central market, acts as a hub for all these local buses. Keep in mind that in very rural or sparsely-populated areas the bus service might be limited to a few buses per day. The Central Valley, the interior region of the country where close to three-fourths of the population lives, has the most developed bus network. Then there are buses between towns, especially larger cities and regional centers. These regional lines usually cost a little over a dollar. The bus runs hourly if it’s a popular route. If not, expect a couple of buses a day. The bus starts its journey at the bus terminal but will pick up people on the way out of town at designated stops. Keep in mind that one of those later stops might be closer to your home than the main terminal. And finally, most towns of any size have a bus heading to and from San José, Costa Rica’s capital. This ride can cost between $2 and $10, depending on how far you’re going. San José is the main transportation hub. If you’re traveling from one side of the country to the other you’ll most likely have to switch buses in San José. To give you an idea, a ride from San José to the northern Pacific beach town of Tamarindo costs about $8, there are two buses per day, and the ride takes about five hours. A great place to get information on regional and cross-country bus trips is thebusschedule.com/cr/. But always call the bus company to confirm routes and times—the phone numbers are listed on the site. Several companies, including TransNica and TicaBus also operate buses that cross the border into Nicaragua to the north and Panama to the south, and even to other countries. The buses are air conditioned, have a restroom on board, and are staffed with attendants. They even play movies. For travel within Central America, this can be a good option. Editor’s Note: Learn more about Costa Rica and other countries in our daily postcard e-letter. Sign up here for our free daily postcards and we’ll send you a FREE REPORT – Why Are Americans Still Flocking to Costa Rica.